Mount Kilimanjaro is the highest mountain in Africa and is the highest free standing mountain in the entire world, with an approximate height of about 4900 meters from the base to 5895 meters above the sea level. It is a dormant volcano in Tanzania with three volcanic cones, Kibo, shira and Mawenzi. Mount Kilimanjaro is a part of the famous Kilimanjaro National park. It is one of the major climbing destination in Tanzania. It was born as a result of the great catastrophic movement of the earth’s crust. mountaineer on 5th October 1889. But only after Dr. Hans fourth try. 3. Mount Kilimanjaro was formed by three volcanic cones, of which some believes Kibo would erupt again someday. But it was 360,000 years ago that the last major eruption took place and so this should not stop you from visiting the place. 4. Mount Kilimanjaro has five major ecological zones. The activities of this zones are controlled by five major factors namely, altitude, temperature, rainfall, flora and fauna. Each zones approximately occupies about 1000m in altitude, making it a major player for shaping the rainfall, temperature and life from the forest upward. 5. Mount Kilimanjaro is still an active volcano rising sheer every now and then. It is climbable during any time of the year but there seem to be slightly more rain during the months of April, May and November. As you pass through the lower levels you will see cultivated farmlands along with wide varieties of birds and fauna in their natural habitat. 6. Interestingly a physically challenged person by name Bernard Goosen from South Africa scaled Mount Kilimanjaro twice in a wheel chair to prove anyone with strenght and determination can conquer even the biggest obstacle. It took him 9 days in his first attempt and only 6 days in his second attempt. 7. 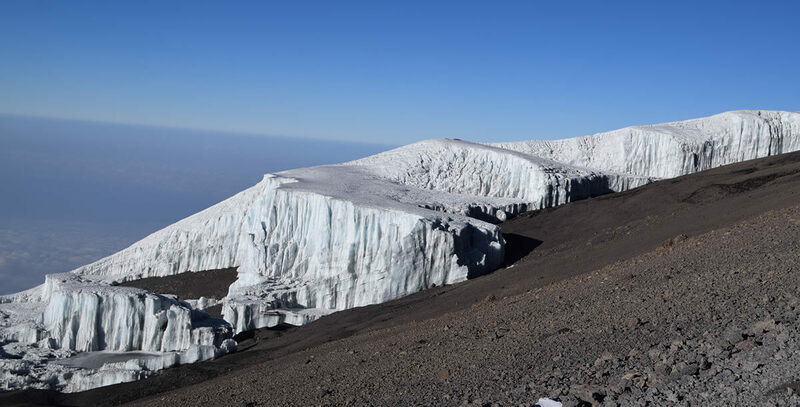 It is sad to learn that the glistering snow caps of Kilimanjaro can disappear in less than 30 years if global warming continues at the same rate. 8. It is a mandatory for everyone climbing Mount Kilimanjaro to climb with a licensed mountain guide and porters as Kilimanjaro sits within the Kilimanjaro National Park. 9. Each year an average of 25,000 people attempt to scale Mount Kilimanjaro. But only 65-75% makes it to Uhuru peak. 10. There are five major routes to Mount Kilimanjaro. They are Kilimanjaro Machame route, Mount Kilimanjaro Marangu route, Kilimanjaro Climbing Lemosho Route, Kilimanjaro Rongai Route and Climbing Kilimanjaro Umbwe route. to anyone who employess it, as well as me. Keep doing what you are doing – for sure i will check out more posts.